Each package must bear a special label with the data on the consignment and a bar code for identification provided therein. The bar code on the package is scanned at numerous stages of the transportation chain, therefore the quality of the label must be high enough to ensure successful scanning and delivery of the package to the recipient. 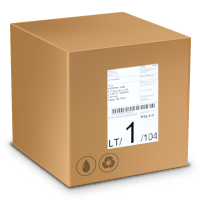 Minimum size of a package must be sufficient to accommodate a packaging label of 100 x 150 mm on one of the sides thereof. Labels should only be printed using the Venipak online system. Labels are only printed in the size of 100 mm x 150 mm. Labels are printed on adhesive paper. Labels may not be applied using adhesive tape, as it renders the bar code unreadable. Labels may only be printed using a high quality printer. Labels may not be printed in case the printer is out of ink (toner), as a label printed in poor quality will render the bar code unreadable. Labels should only be applied to the upper side of a package. Packages with labels applied to the sides thereof will have to be rotated in order to make a scan. Labels are applied right onto the upper side of a package, these may not be folded or rumpled, as this will render the bar code unreadable. Dimensions of a package must be sufficient to apply a label thereupon without folding or rumpling it. A package may only bear one label. No old labels may be left thereon. Old labels may not be crossed out or otherwise damaged, these must be removed completely.